The new National Science Foundation-funded 5MV accelerator represents a major equipment upgrade for the University and is the first accelerator NSF has funded in nuclear physics in nearly a quarter century. It is housed inside a new 40-foot-tall tower located above the existing Nuclear Science Laboratory (NSL) in the center of Nieuwland. The University’s nuclear astrophysics program, started in the mid-1980s, is one of the leading global centers, attracting visitors from 20 to 30 countries. The new accelerator at Notre Dame is helping to recreate stellar nuclear processes in the laboratory to complement the observational studies of new earth- and space-based telescopes that trace past and present nucleosynthesis processes in the cosmos. The accelerator, which replaced the University’s KN accelerator, provides high-intensity heavy ion beams for experiments at Notre Dame’s St. George recoil separator and also increases the intensities for protons and alpha beams. 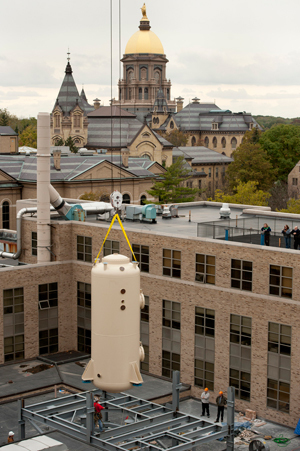 The accelerator is being used primarily to expand the research program of Notre Dame’s Institute for Structure and Nuclear Astrophysics (ISNAP) and the Joint Institute for Nuclear Astrophysics (JINA), a Physics Frontiers Center of NSF. 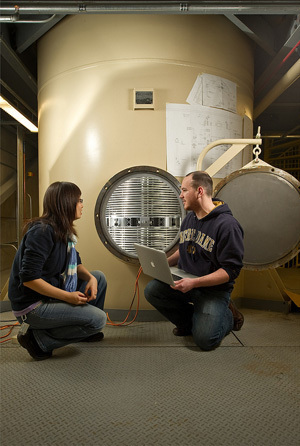 ISNAP is a University research center that operates the NSL at Notre Dame. The laboratory is built around three Van de Graaff accelerators operating in different energy regimes and has a broad program in low-energy physics. These three accelerators offer ideal conditions for experiments exploring basic nuclear physics questions about the quantum structure of nuclei or the origin of the elements in nuclear reaction processes in stars. The NSL accelerators have the capability of producing intense particle beams of both stable and unstable nuclei of various types for research interests including nuclear reactions with radioactive ion beams and nuclear astrophysics associated with stellar explosions. In addition to its basic science interests, ISNAP researchers have developed a number of interdisciplinary applications of nuclear physics techniques primarily in materials analysis and radiation chemistry. In collaboration with faculty from Notre Dame’s Department of Anthropology, PIXE (particle-induced X-ray emission) is used to test the provenance and age of archaeological samples. Environmental studies are being pursued through accelerator mass spectrometry and radioactive counting techniques. The laboratory also pursues research with the medical industry such as the testing of new detectors as well as performing studies of artificial joint components to measure durability. The laboratory’s radiation chemistry program revolves around studies of the effect of ionizing radiation on the molecular decomposition of water and various organic materials, including polymers. The practical aspect to this type of work has direct applications to the management of nuclear reactors and the treatment of storage of radioactive waste. The effect of low-energy radiation on biological cell and DNA material is also of great interest for radiation treatment applications. This work is carried out by the Notre Dame Radiation Laboratory, which is funded by the U.S. Department of Energy. Notre Dame also is the home of JINA, which is one of the world’s leading research institutions in experimental and theoretical nuclear astrophysics using the NSL as one of its core research laboratories. JINA is operated as a collaboration between Notre Dame, Michigan State University and the University of Chicago but has a large number of associated institutions on the North and South American continents and in Europe, Asia and Australia. JINA is funded to foster an interdisciplinary approach to nuclear astrophysics that seeks to coordinate efforts between the astrophysics and nuclear physics communities, as well as those between experimentalists, theorists and observers. The overall scientific goal of JINA is to study the broad range of nuclear processes in our universe that control stellar evolution, trigger supernova events and lead to thermonuclear explosions observed as novae and X-ray and Y-ray bursts. 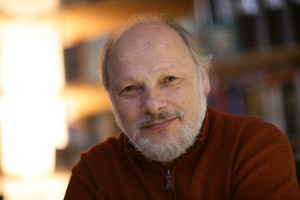 Wiescher, winner of the prestigious Bethe Prize of the American Physical Society, serves as JINA’s director. Originally published by Carol C. Bradley and William G. Gilroy at newsinfo.nd.edu on August 03, 2012.